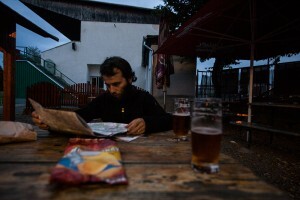 Day 1, Sept 25: Prague to Průhonice, 38 km. 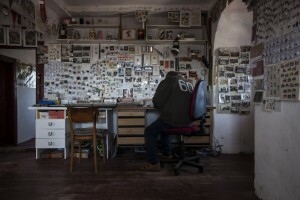 We spent the morning packing up and planning the days ahead, finally deciding to take the route to Vienna that goes more directly south and then east along the Danube. After some errands downtown, including purchasing maps that will take us to Vienna, we finally roll down to the bike path at the Vlatva only after 2:30. Here we see more of the non-touristic city, passing people enjoying the river and some amazing boats used as restaurants and cafes along the banks. One such boat looked like a sidewalk, with handmade benches scattered about and people lounging, watching the river. Although the first section of the route was confusing and we were attempting to trace a path via several different maps at once, we found the correct path fairly quickly using a more detailed map given to us at the car-free day/critical mass in Prague by a representative of the Czech Greenways group. He showed us the series of marked routes we would need to follow to exit the city. Of course there can’t be just one route to follow, so we had to start on the A2, which became the A22, and which included pieces of the A222 and, I think, maybe the 0081. After passing through huge parks, along sports fields, over highways, past goat herds, crossing one street illegally to skip two sets of stairs, and down the center of an interesting example of urban density centered on a park, we finally came to our first sign for the Prague-Vienna path and the edge of the city. 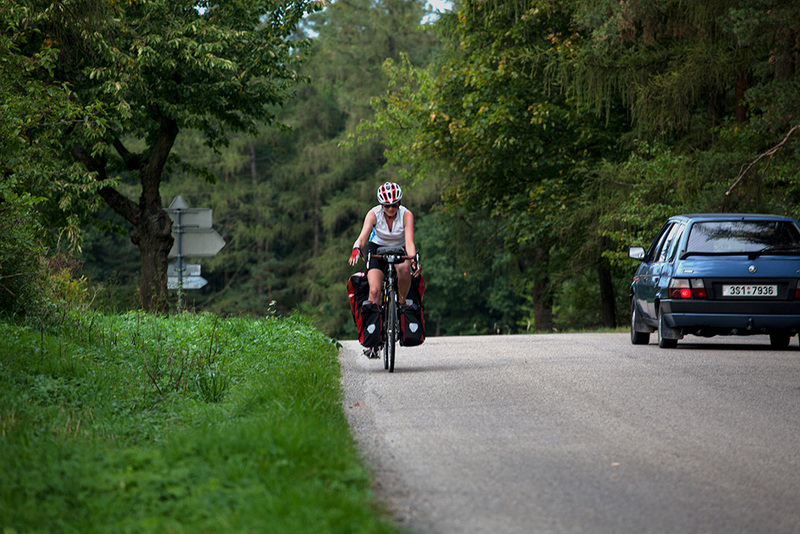 We cycled through fields and suburban villages to a small town marked on our map as hosting a campsite. We were unable to find the site, the only pension was closed, and a neighbor told us that we’d have to go back 3 hilly kilometers to the last town to find a place to stay. The evening had become fairly dark, but we had no choice but to ride back north. The ride back was thankfully very quick and the hills didn’t seem as daunting on the second go. After inquiring at a pension to find it full, we came next to a hotel and decided to happily pay higher prices to have a place to sleep. After a dinner of pizza and pasta we fell quickly asleep in the very comfortable bed. 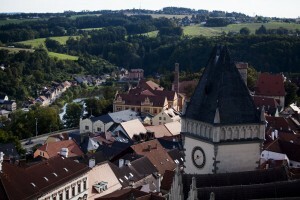 Day 2, Sept 26: Průhonice to Sedlčany, 61 km. We woke mid-morning in our cushy hotel room and sauntered down for the free breakfast, which thankfully included pretty good coffee and juice that seemed to be mostly juice. This is another lovely day, not too hot but warm enough that we won’t shiver in the shadows. 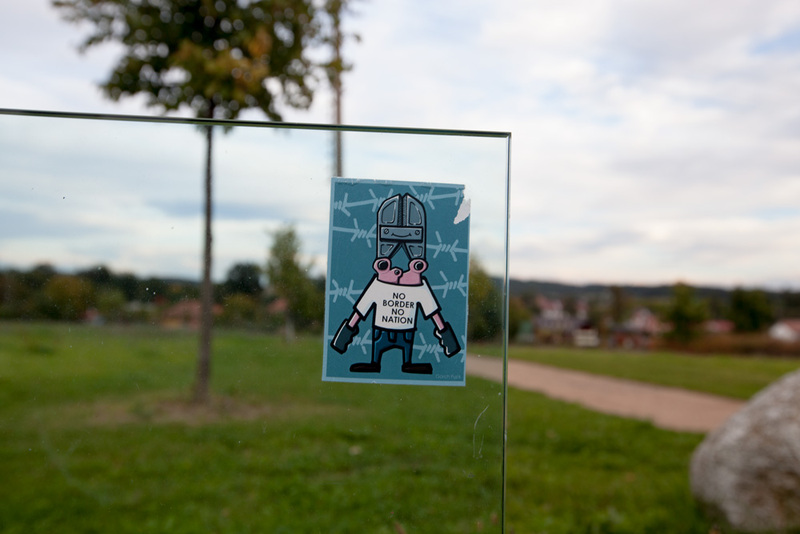 We luckily found a new path that cut off the hills, and we found ourselves quickly past Dobřejovice, the town we’d reached and retreated from last night. More hills presented themselves in short order, however, and continued throughout the day. Just before our planned lunch break in Týnec nad Sázavou we enjoyed a wonderful 8 kilometer long section of road through a beautiful forest, most of which was unexpectedly downhill. 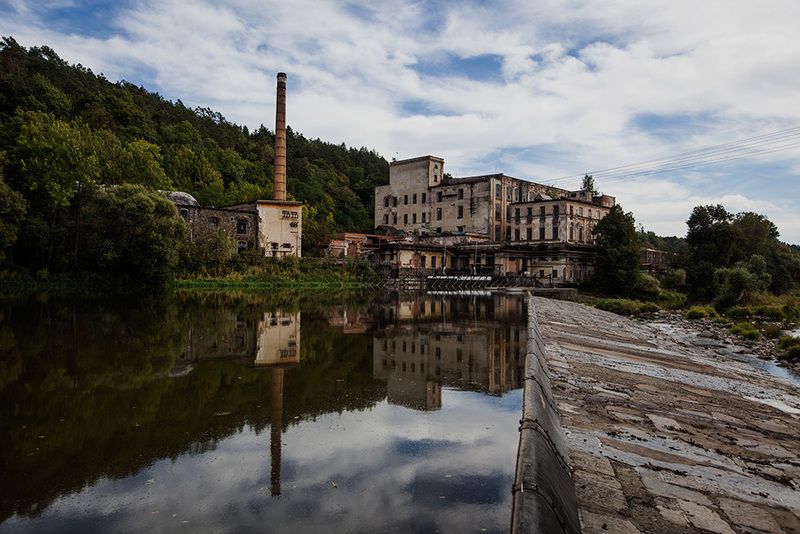 Here we also found another massive, abandoned factory, this one perching hauntingly at the edge of a river. Following lunch we continued our regime of climbing slowly up the hills and hoping for a prompt downhill as a reward. Shachaf found both the strength and willpower to finish most of the hills in this area without stopping, and I’ve developed a method of short breaks mid-hill that has allowed me to not complain too loudly about the ascents. Our guidebook shows a total ascent and descent for each section, and just one of the pages for our route today had 605 meters of ups and downs. We knew that this path would be hilly, but knowing and experiencing are certainly different things. By the end of the day I had cramping in my right calf and felt completely exhaustion. We arrived in Sedlčany in the evening, unexpectedly finding the hostel easily. The hostel wasn’t open, but the very nice bartender at the attached restaurant called the hostel manager and then conveyed to me through gesture and a few words of English that she would arrive in an hour to check us in. We stayed at the restaurant for beers and to check the world online while waiting for her to arrive. The hostel is attached to a sports center, and seems to be meant to host people here for sporting events, hiking, or biking. 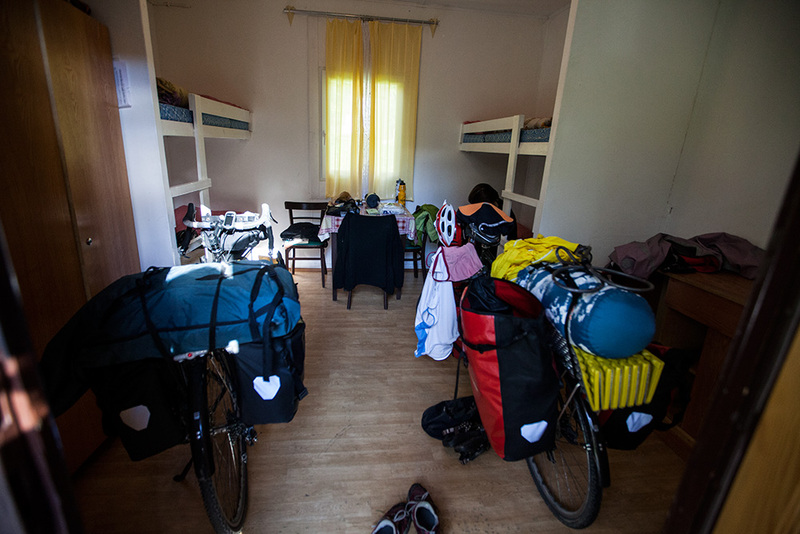 It is certified as a cycle friendly place by the Czech organization that does such things, and we were happy to find that they had a secure room to lock our bikes in for the night. The manager arrived a little early, showing me the room and checking us in using a few words of German and lots of pointing. Shachaf cooked a delicious dinner in the small kitchen while we listened to a variety of Czech TV programs being watched by two very silent men who are also staying at the hostel. 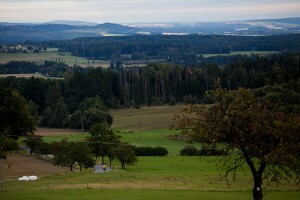 Tomorrow we are on for more hills, as we will be for the rest of our route in the Czech Republic. 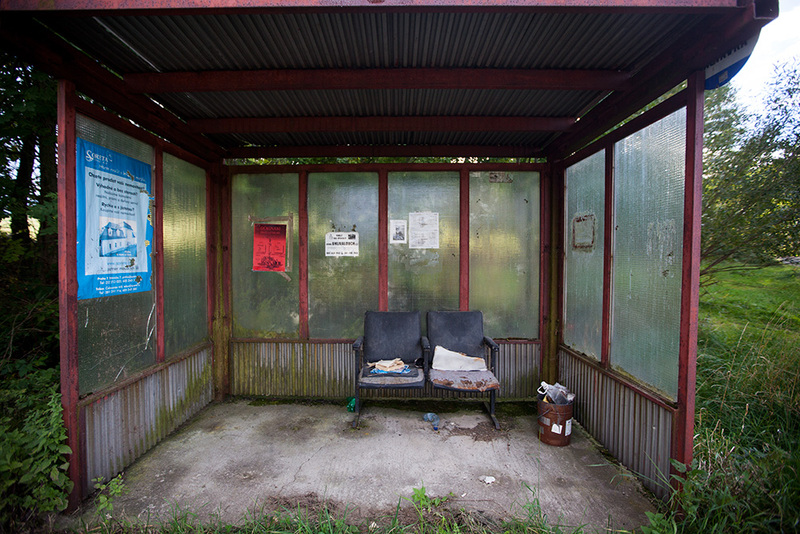 The decision about taking a train might be made by the condition of our knees after more days of constant hill climbs. Day 3, Sept 27: Sedlčany to Tabor, 46 km. Despite waking up with little will power to continue biking, the day turned out to be one of the most beautiful we’ve experienced thus far. We spent the morning looking for accommodation in the towns ahead, and beginning a day-long conversation about which direction to take after Tabor. Drizzle in the morning finished just as we left the hostel, and after visiting the central town square to buy groceries we set off for the days’ many hills. The path from town gave us our first steep ascent, past fields and workshops into an endless series of small villages. The hills today seemed larger but somehow more manageable than those we faced yesterday. Reading the graph of ascents in our Greenways map more closely, we were able to plan ahead for the sections that should take us longer. Although this didn’t alter the hills themselves, somehow it made me feel that the hills were possible to complete when I knew the point that they would end and leave us with fairly flat terrain or a glorious downhill. We stopped for lunch in the center of Prčice, half of the combined town of Sedlec-Prčice. The main plaza seemed recently renovated, with a war memorial, several other statues, and a fountain standing in the midst of tidy small lawns and expanses of new little square cobblestones. We sat in the middle of the empty plaza to eat our lunch and then moved to a restaurant at one edge for espresso and fries. At the information center we learned that there is an annual walk from Prague to Prčice, the 70 km direct path taken in one day! 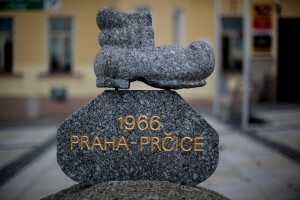 A small statue of a traditional Czech boot in the plaza notes the end of the walk. After lunch we met probably our largest hill so far, with nearly 200 meters of ascent in just a few kilometers. Here the path wound through forests and then fields, rising above the surrounding landscape to give us views across Moravia. High drifting clouds throughout the day kept the temperature cool but not too chilly, and produced striking contrasts at the horizons. We continued with our ups and downs throughout the afternoon, passing more villages and crossing further fields. Although the landscape sounds much the same here as many other days on our trip, somehow the elevation altered the feel of the area. In the evening we had a delightful downhill to bring us towards Tabor, and some light rain to remind us that the weather is only ever tenuously in our favor. We followed signs for “Autocamping” from the main road, hoping that the campsite we’d seen online was still open. Down, down past rows of houses we followed the signs, ending at what looked to be a completely deserted camping area. Shachaf rolled down the hill to the reception as I stayed at the road, certain that the place was closed. Luckily I was wrong, as the camp managers were in the reception along with two other guests enjoying beers. With some gestures and a few words in German we secured a small bungalow and ordered a variety of fried food for a low-nutrition but also low-effort dinner. Despite being largely empty, the camping area had a nice feel to it, with the few people there chatting happily and pop music playing over the speakers. We retired mid-evening to our bunk-bed filled bungalow – empty but for us – to discuss further the routes we could take in the coming days: either continue on the Greenway, take the train to Linz and the Danube, or follow steeper paths into the mountains and over to Austria. 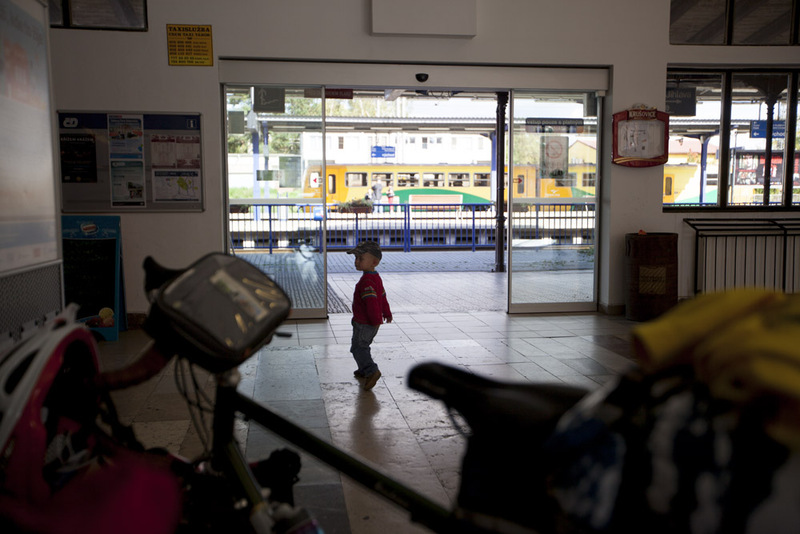 Besides eliminating the third option, we fell asleep without a decision but prepared to visit the train station and Tabor information center in the morning for further research. A few notes that I’ve been meaning to write but keep forgetting about: First, we have seen a number of people with baskets overflowing with massive white mushrooms apparently gathered in the woods. We’ve also been seeing people gathering apples from trees along the road, especially today. Along one particular downhill a family was standing gathering apples from a tarp they’d placed under a tree standing between the road and a field. Two small children were with the group and they cheered us along when we passed, waving their half-eaten apples in front of them. Also, I wanted to note how beautiful and interesting the Czech banknotes are, and how I especially appreciate that there are women on several of the notes. 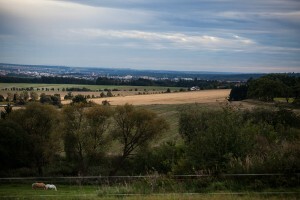 Day 4, Sept 28: Tabor to Tabor, 8 km. It rained on and off throughout the night, and in the morning the small lake next to our bungalow was visibly fuller than it was the night before. We awoke no closer to a decision about which direction to take on our route. After only slight packing and an even slighter breakfast we huffed and puffed back up the hills to the main road and into the center of Tabor. 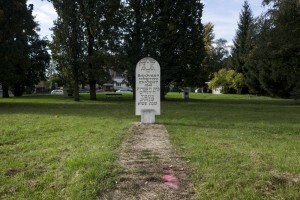 At a larger intersection we found a marker that noted the current park was the site of a Jewish cemetery destroyed in 1941. The Czech Republic seems to have many more memorials related to the Holocaust than we found in the Germany countryside, and, indeed, we found another in Tabor later in the day that marked the location of the former synagogue. Through some small windy streets we made our way towards the central square and the information center. Here we checked the weather – sunny except for rain on either Sunday or Monday – and attempted to check the train times, although the train schedule website continued to be challenging to use. The small breakfast we’d had at the bungalows was not keeping me in good spirits, and with the decision of which way to go weighing on my Libran mind, we decided to get food before heading to the train station to check on tickets. We sat outside at a restaurant on the square, trying to rush the very casual wait staff along. Arriving at the station only 20 minutes before a train to Linz we discovered that the normal ticket window couldn’t help us with an international ticket, and we’d have to wait until the larger office opened in 10 minutes. By the time we found out the cost of the train and the details, we’d missed the last of the more direct routes to Passau for the day. After another hour of debating and indecision (largely mine), we purchased tickets for tomorrow morning on a more direct route to Passau. Although the distance to Vienna from Passau along the Danube is the same as from Tabor to Vienna along the Greenway, the Danube path gives us the assurance of longer days as the route is flat. I feel sad about leaving the hilly terrain of the Czech Republic, especially after yesterday’s particularly wonderful cycling, but the Danube is meant to be gorgeous and must be the most popular cycling path in Europe for a reason. Hopefully we will also find many more campgrounds on that route, and more options of places to stay in general. Finally decided on our path, we rode back into the center of town and found a room at a pension called the Blue Rose, but in Czech. The room looked to be decorated with cast-offs from 1985, but is large and has its own bathroom across the hall. We leave our bikes in the small back garden, change into street clothes, and walk back into the afternoon sunshine to see more of Tabor. The town is of a pretty fair size, and this older area is filled with winding streets that date to the 1400 and 1500s. 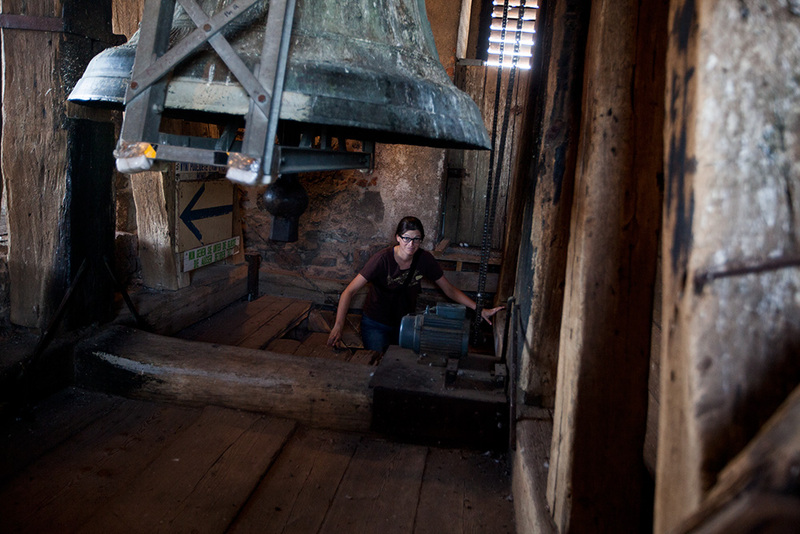 We climb the church tower, which is a rickety frightening climb along steep wooden stairs that look original to several-centuries-old construction. We even need to climb underneath the church bell, our heads inside the massive iron bell as we duck to the other side. 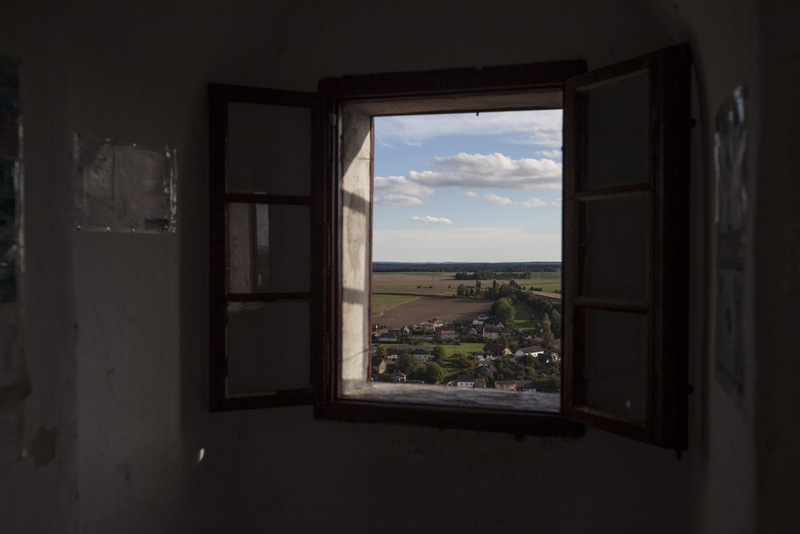 The views were worth the climb, as was the visit to the strange antique shop that filled most of the tower room. The man who collected the small fee for the tower was also the proprietor of this shop, which sold old stamps, old currency, old maps, small stones and mineral samples, and a few other odds and ends. In the evening we wandered through some further streets, stopping at the newly opened Tabor Museum of Chocolate and Marzipan to buy a few absolutely delicious chocolates, including a crunchy almond dark chocolate haystack that was possibly the best chocolate treat I’ve ever eaten. 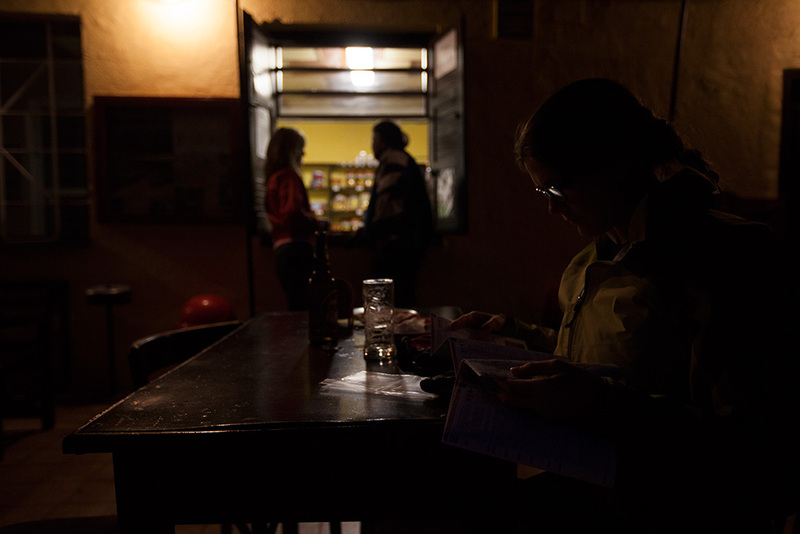 We sat again in the central square for espresso and Kinley ginger ale, which is also delicious, to catch up on the blog and read in the chilly Czech evening – our last in this country for the trip. 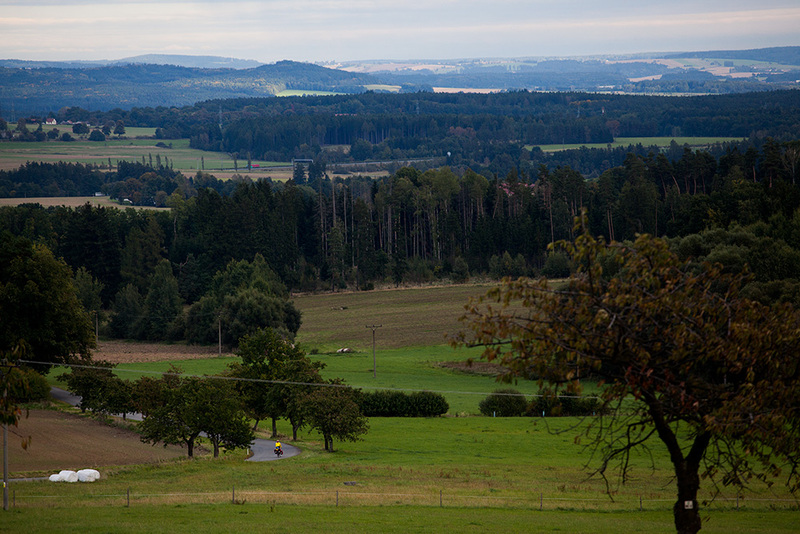 I’ve found the Czech Republic interesting, and think that if we returned again I’d like to be lighter on the bike, or else spend our time hiking so that we could see more of the forests and mountains. One strange sight from Tabor today was a murder of crows swirling about over the train station, squawking and circling for a while before heading off. They were followed by flocks of other birds also flying past in a somewhat alarming fashion, suggesting maybe a change in the weather or possibly that autumn has truly arrived. We enjoyed a wonderful dinner at a restaurant that focused on local foods and restoration of the historic building that it occupied. The reasonably priced and delicious meal made us both a little sad to be leaving the Czech Republic tomorrow. Back at the pension we purchased our flights from Budapest to Tel Aviv, which – although still not for more than two weeks – does seem to denote that we are nearing the end of our cycling adventure.